It is week 7 in the review of the CRM Field Guide chapters from the book – The CRM Field Guide – How to CRM like an MVP with Microsoft Dynamics CRM. This week it is the 50 page monster Sales Management Best Practices. If you are new to Dynamics CRM or any CRM system after reading Chapter 1 – Introduction to Dynamics CRM 2011 in the Field Guide you should jump to this chapter next. I am designating any chapter in the book that is 50 pages or more as a monster chapter. The coverage of the subject matter in this chapter is more than just a regurgitation of the forms, views, fields and related ribbon bar functions that comprise the CRM 2011 Sales Module. It is one of the few publications that I have seen that provide real world scenarios and decision making steps for considering the use of the built-in functions. One of the first practical issues it tackles is When and How should leads be Used? 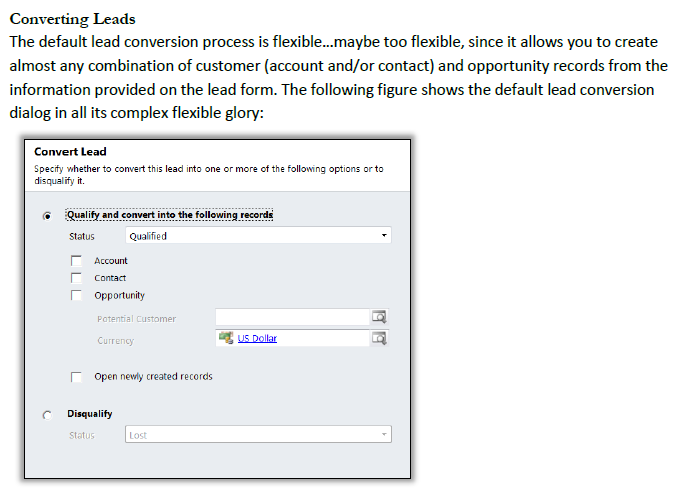 And the alternatives in using the powerful but sometimes restrictive Convert Lead dialog window. Another area it doesn’t shy away from in terms of providing practical real world presentation of the scenarios is – Should you use the Product Catalog? The product catalog in Dynamics CRM is one of the most unused features of the product (IMHO). It is kind of like a Rubik’s Cube, hard to figure out how to get the data inserted into the system as it seems like there are multiple data-points that have interdependency’s. There are compelling reasons when to utilize the User Provided pricing option and when not to use it.